The structural-elite’s stooges in the main-stream media, and Pig Pharma ‘research’ labs, are still choosing to remain willfully-ignorant of the scientific evidence, which reveals Zika as a virus that, in all but a few cases, causes mild flu-like symptoms; it does not cause birth defects, nor is it sexually transmitted. As with the global warming hoax, Zika is being pandered to the multitude of suckers (educated and uneducated) who still blindly believe anything a Pig Pharma or Weather Channel PhD panders as ‘scientific fact’. Some of these folks are highly educated people who warn us not to watch television, nor believe anything we hear from the main-stream media. And yet these folks buy into the global warming hoax, and many of these virus psyops as well, which are all pandered by the main-stream media, 24/7/365. I guess one way to explain this would be, we are all existing in a retrograde inverted world! he long established entirely benign Zika virus turned suddenly deadly by Western mainstream media in 2015 has been morphing in its alleged characteristics at ISIS-like speeds. The virus suddenly was claimed to cause microcephaly in Brazil in 2015. And when that was debunked by doctors in Brazil who exposed the pesticide-newborn malformation connection the media, the WHO, the UN and the politicians involved in this psychological operation decided to ignore the reality and the evidence and falsely continued to claim that Zika virus causes microcephaly when they know damn well it does not and never has. Not letting facts, reason and logic get in the way, the Zika virus apparently took matters into its own hands and then magically started doing more things it had never done; it became a “sexually transmitted” disease before our eyes and packed its bags and started conveniently traveling the world like a seasoned traveler on vacation recently arriving in Florida and now triggering what will soon be an avalanche of profits for the pharmaceutical industry as their “researchers” work overtime to get the money flow going. Incidentally, notice there seems to be a pattern between WHERE the virus travels and the desired profit-based “solution” outcome. For example, if Zika had only parked itself in a remote country or island not heard by most then the profits would not have been that easy to come by. It knew to get on a plane and (like ISIS) arrive in none other than the United States where the propaganda can be easily ratcheted up and converted to instant profits. That said, the time to celebrate the money flow is much closer according to mainstream media who is now reporting that a team of researchers “inch closer to Zika treatment.” Is anyone who is aware of the ruling elite’s Hegelian Dialectic model for implementing mass “solutions” (which always involve mass profits and mass completion of their agendas, in this case depopulation as well) surprised by any of this? 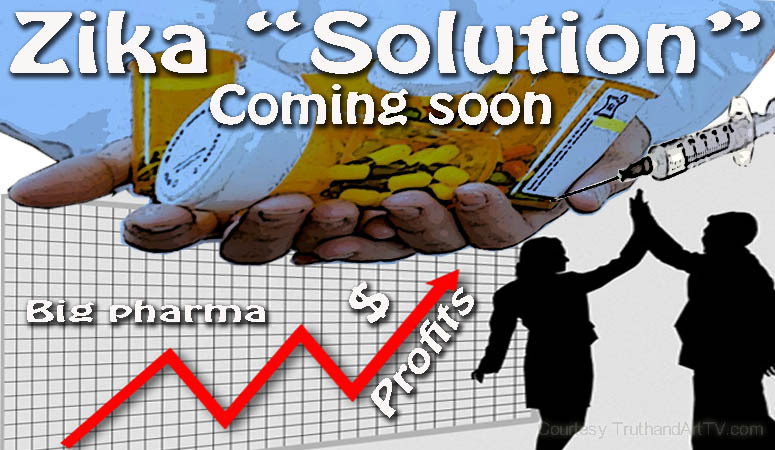 And with that the urgency is artificially created to create the “solution” to the non-problem to quickly pack the big pharmaceutical industry bank accounts with lots of money as soon as possible. No clear-cut scientifically and medically verifiable stories and images of people dying from Zika virus is required here. No concrete medical records, no evidence-based independent studies required or a true explanation of how a simple Arbovirus could suddenly completely alter its known characteristics (its benign characteristics clearly outlined in medical text books worldwide until recently) and suddenly transmit and infect humans in a vastly different way without any medical-scientific explanation. The deep medical reality that everyone has to see here is that if Zika virus causes “sexually transmitted microcephaly” now, then it would have done so not only in 1947 when it was officially patented (by the Rockefeller Foundation) and eventually identified but it would have done so hundreds even thousands of years ago when it was around then, too, even if the cause was not confirmed. As I’ve stated before, this idea that viruses suddenly transmit from one vector to a brand new vector it has never used before is far more fictional and inconsistent with nature than most readers can appreciate.